their first game of three in the series. Boston, Mass- It's time. The Red Sox got the chance to rest this week for the All Star Break, with all position players staying home and watching the All Star Game from home. Only Koji Uehara and Jon Lester got the invite, and they pitched a combined 1.1 innings for the American League. Overall, the break was used for the reason it was intended: to relax and get some time away from the game. The Red Sox sit in last place in the AL East after 95 games, and are nine games under .500. This is their worst record at the break since 1997. They will need close to a miracle to make the playoffs this season, but the year is not lost yet. With half of their starters as rookies, Boston took two of three from the lowly Astros, and Shane Victorino looks to be coming back this weekend. However, the Royals are not the Astros. 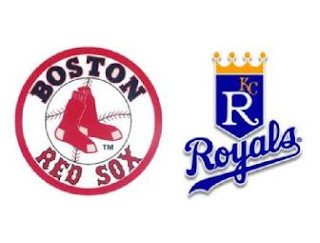 The Sox will have to play better to match up in this three game series versus the 48-46 Royals, who have an ace in James Shields and one of the best closers in baseball, Greg Holland. Tonight, Kansas City will give Shields the chance to go 9-2 against the teams of the AL East since his departure from Tampa Bay. Boston counters with Clay Buchholz, who pitched the best game of his season last Sunday, going the distance to record his fourth win of his injury plagued season. Buchholz looked as solid as can be against the Astros, striking out a career high 12 men, while only allowed three hits. With the Red Sox getting the chance to shuffle their starting rotation, they begin the second half of the season with Buchholz, Rubby de la Rosa, Jon Lester, John Lackey and then Jake Peavy. Peavy is last to give the Red Sox the most amount of time to find a suitable team to trade him to, as it is well noted that Boston needs a bat for an arm, and Brandon Workman is just a call away in Pawtucket to join the Red Sox starting rotation. Boston has no more time to fool around, and if they want to turn their season around, then have until the trade deadline to do it. They schedule has them playing Kansas City for three, then in Toronto and Tampa Bay for 7, then back to Fenway to face Toronto for three more. With the league leading Orioles facing the toughest part of their schedule, Boston has no better time then now to gain some ground. But if it's not done by the end of the month, expect this Red Sox team to look completely different by August 1.